Now that you have your braces, how do you take care of them? 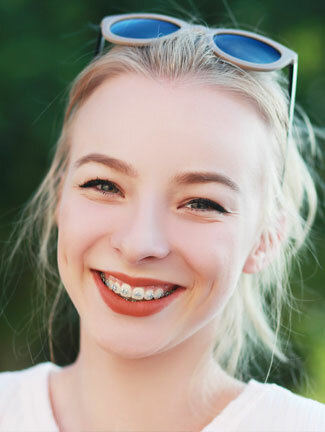 It's important for you to know how to properly take care of your braces throughout your entire orthodontic treatment, so we've provided some helpful tips and suggestions. Don't worry, you'll be eating popcorn and snacking on potato chips again in no time! However, before you can start enjoying some of the treats you love, you will need to take special care to avoid any foods that could damage your new appliances. For the most part, common sense will tell you what you can and cannot eat. For instance, hard foods can damage wires and brackets while sticky, chewy foods can get caught between brackets and wires. We recommend that you also minimize sugary foods since they can cause tooth decay and related problems. When you first get your braces, you may notice that your teeth and mouth feel a little tender or sore. This is perfectly normal for patients who have just gotten their braces put on, and we promise your mouth will not be sore forever! To relieve the discomfort, we recommend taking a pain reliever, such as ibuprofen or acetaminophen. It is also not uncommon for your lips, cheeks, and tongue to become irritated for one to two weeks as they toughen and become used to the braces. We would be happy to give you some wax that you can put over the braces to lessen the tenderness. If you need some wax, please let us know! If at any time you are experiencing an abnormal amount of discomfort, please feel free to give us a call. Occasionally, minor orthodontic emergencies such as poking wires, loose brackets or bands, loose wires, or loose appliances can occur. If this happens, please contact us as soon as possible so that we can check and repair your appliance. If any piece of your appliance comes off, be sure to save it and bring it to the office with you. You can temporarily fix a loose wire by using the back of a spoon or the eraser end of a pencil to carefully and gently push the wire back into place. If the loose wire is causing irritation to your lips or cheeks, put wax or a wet cotton ball over the broken wire to relieve the pain. For video instructions, visit our Caring For Your Appliances page. Damaged appliances can increase the length of your treatment process, so be sure to take care of all your appliances. Your teeth and jaw can only move into their correct positions if you consistently wear the rubber bands, retainer, or other appliances prescribed by Dr. Godwin and his team. Game, Set, Match - we have great news for athletes! You can still play sports even while undergoing orthodontic treatment! If you do play sports, it's recommended that you wear a mouthguard in order to protect your teeth and your appliance. We have special orthodontic mouthguards available at the office that are designed to fit over your braces. Please do not use the Boil & Bite mouthguards if you have braces! Just let us know if you need a mouthguard – we’re happy to offer you one at no charge. Halloween is a fun time of year, but before you head out to trick-or-treat, Dr. Godwin would like to offer a few tips for keeping your braces healthy and happy. While Halloween treats are tempting, it’s important to remember that many can cause havoc for trick-or-treaters with braces. Treats that are sticky, chewy hard or crunchy can potentially cause damage to braces, clear aligners, and other orthodontic appliances. In addition to patient discomfort, a broken bracket or loose wire may prolong treatment and require additional appointments. 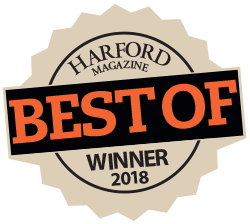 Our team knows hard it is to avoid all Halloween treats, so we encourage you to enjoy braces- friendly alternatives rather than feel that you are missing out on all the fun. Dr. Godwin recommends that a few sweets can be okay occasionally, provided that you remember to brush and floss after eating. Check out our frighteningly-good Halloween recipes and braces-friendly tips so that you can enjoy the holiday and still be on pace to achieve your healthy, beautiful smiles. In general, orthodontic patients should look for foods that are soft and easy to chew. Soft, melt-in-your-mouth chocolates, peanut butter cups, milk shakes, gelatin, ice cream treats, and most cookies and cakes. Patients undergoing orthodontic treatment should avoid treats that are sticky, hard, chewy or crunchy, such as caramel, nuts (including candies that contain nuts), licorice, jellybeans or taffy, hard pretzels, bubblegum, candy corn, and popcorn. 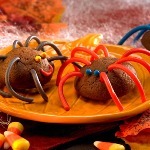 Click on the image to download the following recipes: Spider Bites, Frightfully Fabulous Cupcake Sandwiches, Pumpkin Cookie Pops, Peanut Butter Eyeballs, Marvelous Molasses Cookies, Pumpkin Chocolate Chip Softies, and Slimy Lime Punch. Enjoy! !